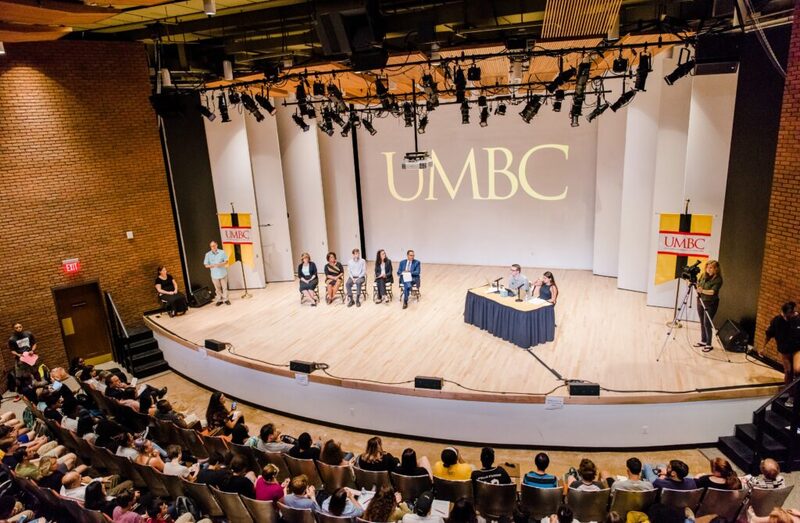 Hundreds of UMBC community members gathered on Thursday, September 20, for an open listening session on sexual misconduct, in a painful and powerful moment for the university. 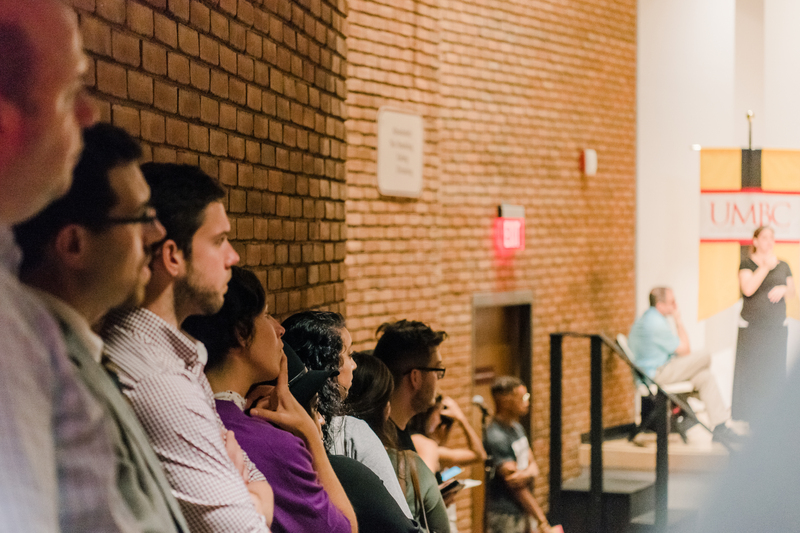 A large crowd rapidly filled the Fine Arts Recital Hall and then two overflow spaces in the biology building and library, connected through a live video feed. As everyone took their seats, ready to begin, a sense of quiet tension filled the space—a community taking a breath, ready to speak and to listen. UMBC leadership, the Student Government Association (SGA), Graduate Student Association (GSA), We Believe You, Resident Student Association, National Pan-Hellenic Council, and Student-Athlete Advisory Committee co-organized the session. 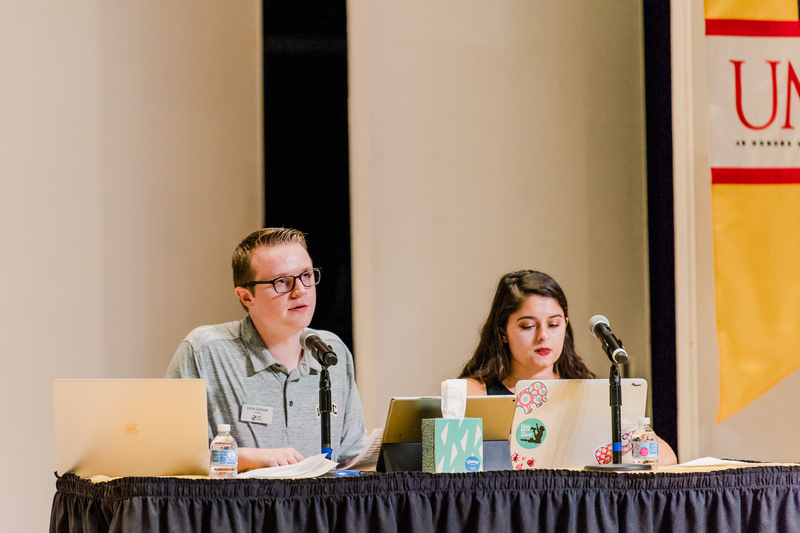 Collin Sullivan ‘19, information systems, president of the Student Government Association, and Kim Spadafora ‘20, mathematics, vice president of We Believe You, served as moderators. Student leaders Collin Sullivan (l) and Kim Spadafora (r) onstage at the listening session. 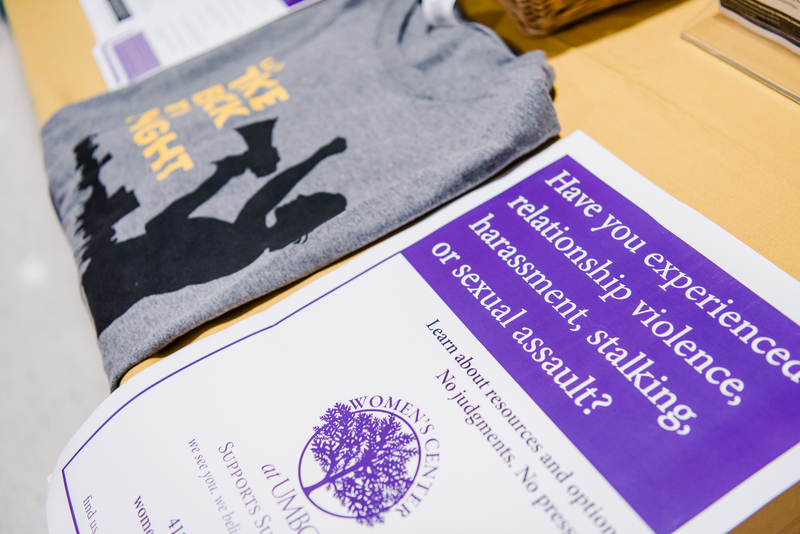 Representatives from the UMBC Counseling Center, Women’s Center, University Health Services, Green Dot, and Relationship Violence Awareness and Prevention advocates were onsite to provide support if needed. Materials from the Women’s Center at UMBC in the resource area for the listening session. President Freeman Hrabowski at the UMBC listening session on sexual assault. Over the next two hours, students and others came to the microphone or submitted anonymous comments through index cards and a webform. Many shared anger about painful experiences of sexual assault and struggles navigating campus support services and the Title IX process. UMBC community gathers for the listening session. Students powerfully argued for change in how the university works to prevent and respond to incidents of sexual misconduct. Examples include requiring evidence-based sexual assault prevention training for all new students, faculty, and staff; expanding health services; and making the Title IX investigation process more responsive. UMBC staff members listen to student voices during the event. Following the event, President Hrabowski, Provost Philip Rous, and listening session partners responded with a firm commitment to taking both immediate and longer-term action to address several concerns brought by students. To begin next steps, they named a team to lead this work in collaboration with student, faculty, staff, and alumni leaders, effective immediately. This team will be responsible for reviewing recommendations heard through the listening session, other meetings, and formal statements, in collaboration with campus partners. Members include Vice President for Student Affairs Nancy Young; Vice President for Administration and Finance Lynne Schaefer; Assistant General Counsel Morgan Thomas ‘13, political science; Chief of Staff Candace Dodson-Reed ‘96, English; Women’s Center Director and We Believe You Advisor Jess Myers; and psychology professor Christopher Murphy, whose research focuses on abuse and violence in intimate adult relationships. In addition to moving the work forward, this group will also keep the campus updated on next steps and how UMBC community members can stay engaged. 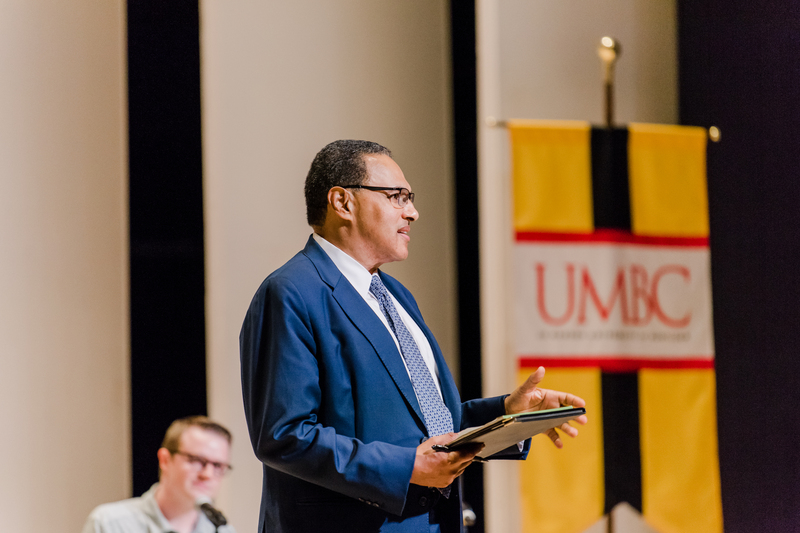 The morning after the listening session, President Hrabowski spoke with the University System of Maryland Board of Regents about the event, and how student voices continued to echo through his thoughts. He was joined by Sullivan, Spadafora, and Adam Harvey, M.S. ‘17, a physics Ph.D. student serving as GSA vice president and newly elected chair of the University Steering Committee. Header image: UMBC community gathers for the listening session, with university leaders onstage. All photos by Marlayna Demond ’11 for UMBC.